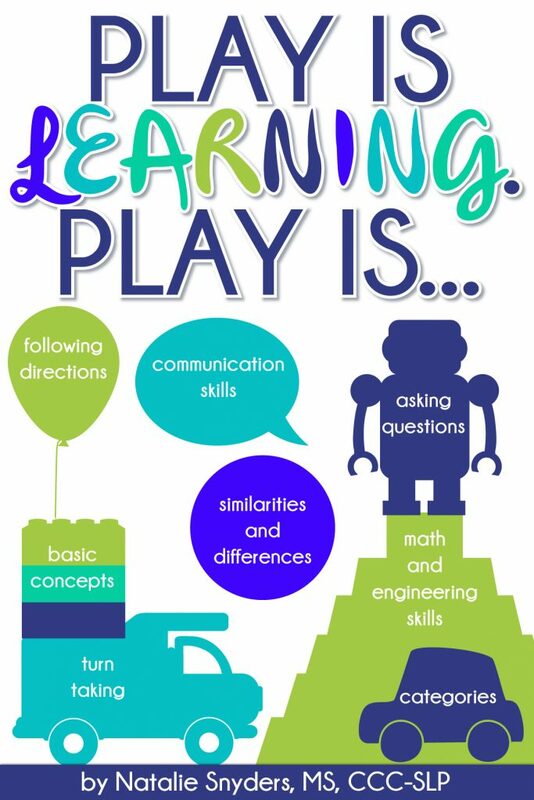 As a school based speech language pathologist, I have the privilege to work on a team to help students learn and grow to their highest potential. 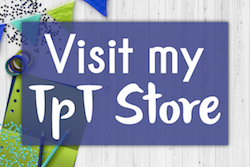 In my career, I’ve worked with a wide range of general education teachers, special education teachers, psychologists, nurses, social workers, physical therapists, occupational therapists, reading specialists, instructional and individual aides, and more. One thing I love about this is how much I get to learn from these other disciplines! I’m lucky if I get to work with my students for 60 minutes a week – these professionals have invaluable insights about the students themselves and what issues they are seeing from their particular viewpoint. This helps me serve my students better; both with more compassion and understanding, as well as allowing me to more efficiently utilize my therapy time. If I know a certain student is struggling with following directions in the classroom, or is dealing with a difficult situation at home, I am able to adjust my therapy accordingly. In a similar vein, I know that my insights are valuable, too – but not everyone understands what I do or what I know. 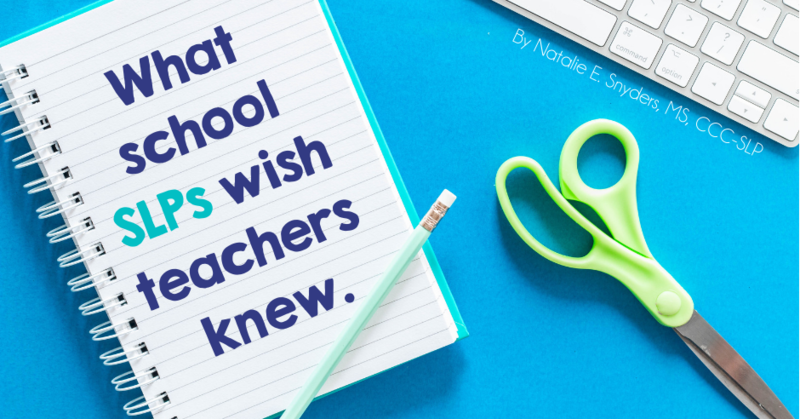 If I could sit down over a cup of coffee with teachers and staff everywhere, here’s what I would want them to know. 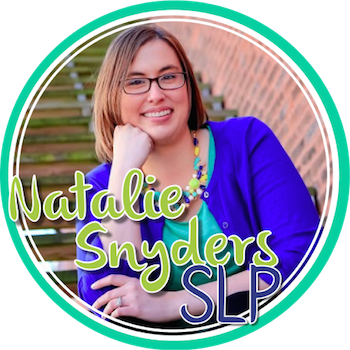 What my title is, what the letters “SLP” mean, and what I do. 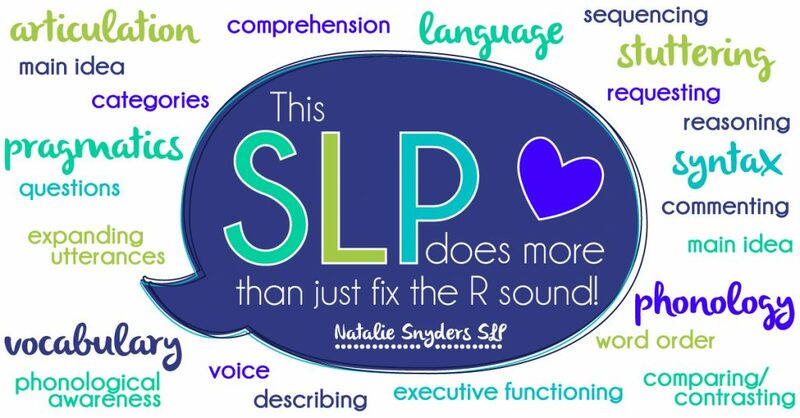 This title is important, because we still come across a large number of people that don’t know that we work with more than just speech sounds. 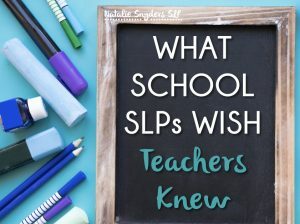 As SLPs, we love what we do, and we want other people to know what we do, too! Let’s use the correct terminology for other things, too. I often hear some outdated terms – like with most things in education, our terminology has changed as time has passed. 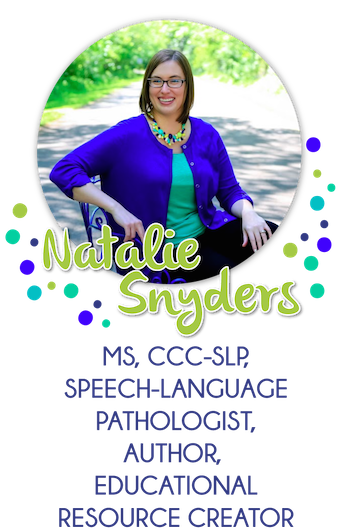 Most SLPs don’t use the term “speech impediment” – if you are talking about difficulty saying certain sounds, that is an articulation or phonological disorder, while if you’re talking about getting stuck on words, that is stuttering or a fluency disorder. If you’re not sure what to call something, please ask! You might see us playing games, but we’re working on valuable skills. Seriously. The areas I work on in therapy have a direct impact on my students’ performance in the classroom. In fact, by law, I’m required to tie what I do in therapy to the academic standards in my state. But more than that – if your student doesn’t understand what question words like “When” or direction words such as “before” or “after” mean, he or she is likely going to struggle greatly with general classroom tasks, causing frustration for both you and the student. If your student leaves off the ending sounds in words (a phonological disorder), he or she is going to struggle greatly with learning to read and spell. If your student doesn’t understand how to retell events in a logical sequence, his personal written narratives are going to be disorganized and nonsensical. If your student doesn’t understand how an apple and an orange are the same and different, she’s not going to be able to compare and contrast the different sides of the Revolutionary War. We’re both working towards helping our students grow, learn, and have the best lives they can. Please ask me questions. I can help you! I have extensive knowledge in teaching vocabulary. I can help you give your students have a better chance on high stakes standardized tests. I can give you tips and wording suggestions so your students understand you better and get more from your lessons. I can help you reduce background distractions in your classroom. I may be able to explain which words your student is going to have trouble spelling and why they are struggling with phonological awareness. I have a stash of great children’s books and can show you how to use them to reinforce a skill you are teaching. I can help you build a better rapport with our mutual students. I can tell you what red flags to look for in students with potential learning and language problems. I can learn from you, too! You are an expert, too! You have way better behavior management skills than I do – trust me, there’s a reason I prefer working with small groups! You know the curriculum and what the students need to be able to do independently. I love when you stop me in the hall or send me an email to let me know how one of our students is doing, or if they are really struggling with something. What would you add to my list? Leave a comment below!